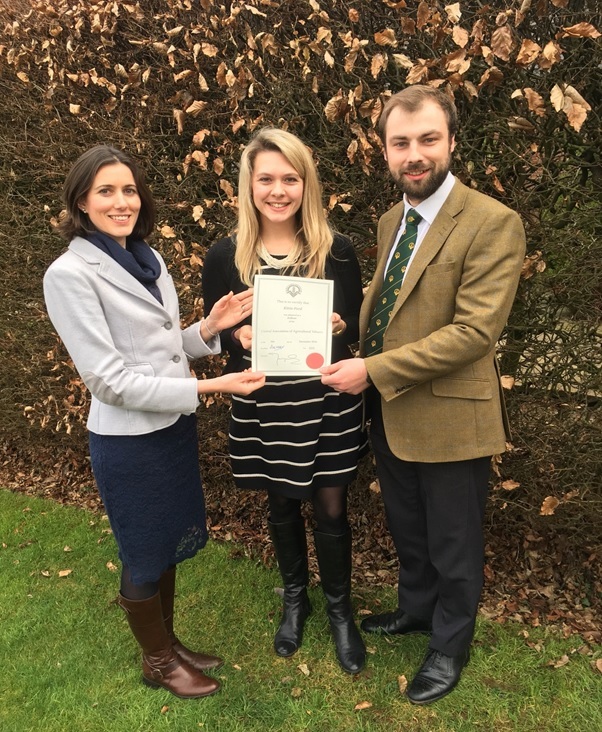 Kittie Ford, a Rural Chartered Surveyor at Sheldon Bosley Knight, received her official certificate for Fellowship of the Central Association of Agricultural Valuers (CAAV) recently at the Midland Counties Agricultural Valuers AGM. Kittie was also elected to be a Junior Council Member of the Midlands Association, joining Ted Beale who is Vice-Chairman of the Young Valuers Council. The CAAV exam for fellowship consists of a rigorous two day “endurance test” of practical, oral and written assessments on a wide range of practice areas including landlord and tenant, utilities, diversification, planning, estate management, valuation, growing crops, machinery and livestock. Kittie is photographed receiving her Fellowship with fellow Surveyor Ted Beale, and Director, Laura Gaydon.